Circulating Now welcomes guest blogger Loren Miller, PhD. Dr. Miller is a curatorial assistant at the Smithsonian National Museum of African American History and Culture and guest curator of NLM’s exhibition, Physician Assistants: Collaboration and Care. The physician assistant (PA) profession started as a uniquely American career that developed as a reaction to the changing social, cultural, and health care landscapes of the mid-20th century. Over the past 50 years, PAs have become an essential part of the U.S. health care system. Physician Assistants: Collaboration and Care, the new online and traveling exhibition, celebrates the field’s unique history, its current thriving state, and its bright future. This blog will explore how convergences in American history led to the creation of the profession in 1965. Between 1940 and 1964, the ways in which physicians practiced medicine and people paid for services changed dramatically. After World War II, the country saw a decreasing number of generalists and an increasing number of new patients. 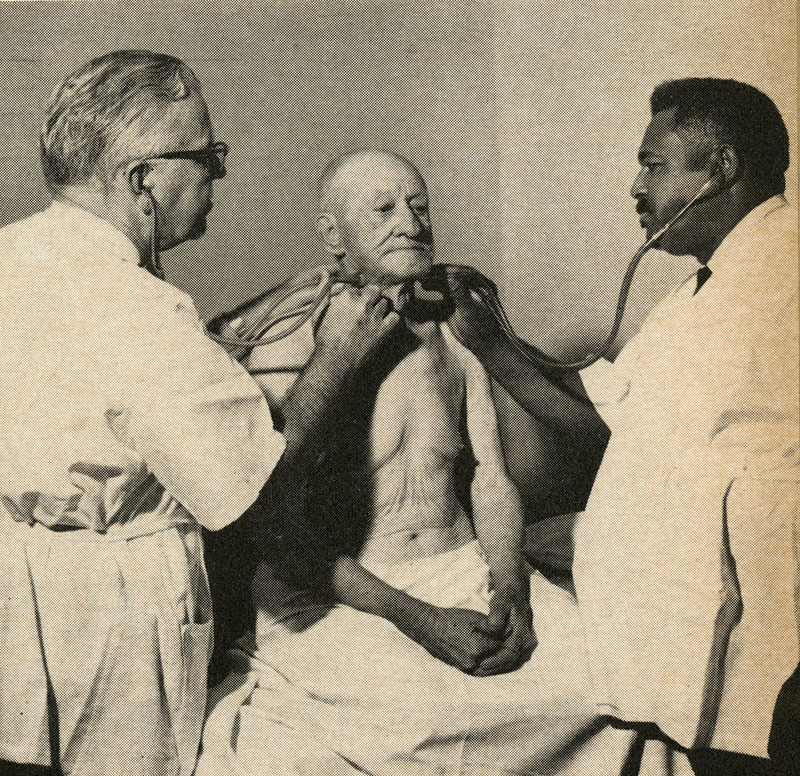 The technological advances of the post-war world drew physicians away from practicing general internal medicine to specializing in particular fields. This alteration led doctors to practice in hospitals more than private practices, which were often located in highly populated areas. So, as physicians moved away from general medicine and private practices, their absence left poor and rural populations with little support. America’s growing wealth and the baby boom that followed the war rapidly enlarged the population and the country’s health care needs. At the same time, employers began paying for employees’ insurance as a benefit, due to rising health care costs. Increased insurance allowed many more people access to care. Between 1945 and 1960, the number of insured Americans rose from 32 to 122 million, and the amount of money people spent on physicians climbed from five to 83 million. But while access to medical care and insurance improved for many Americans, health care remained out of reach for the country’s poor and rural populations, creating a significant gap in the U.S. health care system. The imbalance between the country’s number of insured patients and physicians widened further in the 1960s, when American social movements helped create the first national health programs. Movements, such as civil rights, cultivated people’s beliefs that all citizens had a right to health care. The federal government institutionalized these principles when it passed the Medicare and Medicaid amendments in 1965, which provided insurance for people who could not afford it. The two programs added a significant number of new, previously underserved patients to those paying for health care through insurance. 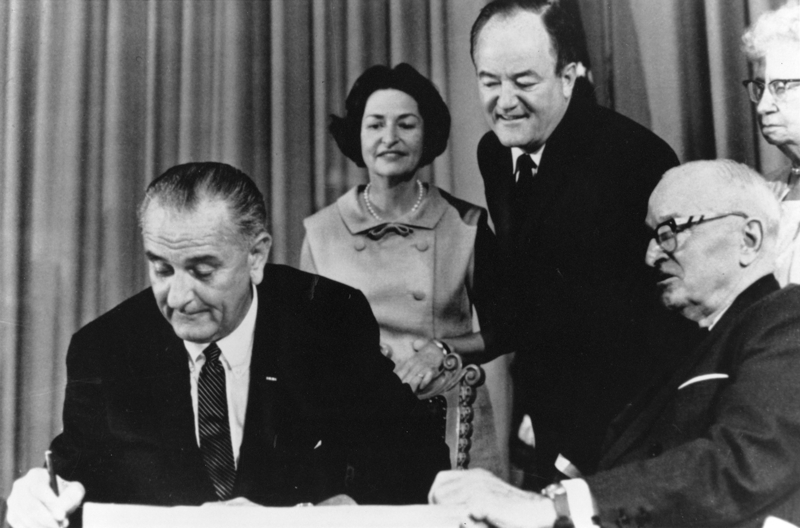 President Lyndon Johnson signs the 1965 Medicare bill. This convergence of events created a physician shortage that could not be filled quickly enough, and it led some medical professionals to begin exploring alternative solutions. Dr. Eugene Stead was the first person to create a working solution to the problem. He envisioned a program that would train people with previous medical experience to become generalist-assistants who would help physicians in a broad number of ways and practice with physician supervision. He based this model on the collaborative relationship between Dr. Amos Johnson and his assistant, Buddy Treadwell, who had worked together in this manner to serve a rural community in North Carolina since the 1940s. In 1965, Dr. Stead successfully opened the first academic PA program at Duke University, and he used a formally untapped resource to obtain its first students. During this time, the Vietnam War was producing a wealth of military corpsmen who were highly trained in medical skills. Many of the returning corpsmen were looking for work and had no way to enter the medical field in civilian life. Duke’s new program was a perfect fit for many of these veterans, so the first class of PAs consisted of four Navy corpsmen. The program built upon their existing knowledge and training by providing nine months of broad medical training and 15 months of clinical rotations. The first PAs graduated from Duke’s innovative program on October 6, 1967, giving birth to the profession. The new field quickly expanded as similar programs opened. Comparable courses, such as Dr. Richard Smith’s Med-ical Ex-tenders (MEDEX), placed a strong emphasis on working with underserved poor and rural populations. PA curriculums sent students to work with people in need during their rotations and then placed graduates in poor and rural areas. In the 1970s, the government became concerned with rising health costs, which resulted in mounting support for the profession. When the American Medical Association recommended PAs as primary care providers in 1971, it was a major victory for the profession. Since PAs were significantly less expensive than physicians, this development led the government to increase federal funding for PA programs. While the profession has gone through many changes since then, throughout the last half-century, it has maintained its original emphasis on collaboration and excellent patient care, while expanding its diversity, specialties, and geography. To learn more about the development of the PA profession, check out Physician Assistants: Collaboration and Care online. Visit the Exhibition Program website to find out when the traveling exhibition is coming to your town. I enjoyed the story. With the smaller availability of physicians today,The PA can help a great deal. Thanks for sharing your thoughts about PAs. Thanks for doing this article, Dr. Miller! The way you put everything in historical perspective is outstanding. Something that might be of particular interest to you is the fact the PA profession, and the four PA organizations that have shaped it, have always been inclusive — unlike our counterparts in other health professions. The first African American to become a PA, Prentiss L. Harrison, graduated from the Duke University PA program in 1968. The first female PA, Joyce Nichols, graduated from the Duke PA program in 1970. They were integral to the profession’s development because in the early years the first PAs helped create pretty much anything having to do with it. Thank you for your comment, Janette! Your statement about the profession’s diversity and inclusion is so true, and the efforts to recruit a wide range of people have only increased over time. People like Prentiss L. Harrison and Joyce Nichols who helped shape the profession are indeed very important in the history of the field. You might be interested in checking out the “Diversity Makes a Difference” section of the online exhibition, which talks more about this subject. Thank you again for reading and taking the time to share your thoughts! My pleasure. Thank you for all you and your colleagues do for the Smithsonian museums. My family is a NMAAHC donor so I was especially excited to see your name and affiliation.